Electrolyte replacement can make the difference between finishing a marathon and being transported to a hospital in critical condition halfway through the race. Electrolytes are small ions, or charged particles, that are essential for nerve and muscle function. During strenuous exercise, electrolytes are depleted and lost through sweat. Signs of electrolyte depletion include weakness, confusion and even death. Gatorade, a sports drink, was developed to replenish the body’s electrolytes, but you can replace electrolytes in other ways. The most common electrolytes lost through physical activity are sodium and potassium, both of which are readily available in common foods. Sodium is found in cheese, green olives, crackers, breads, meats and other processed and salty foods. Good sources of potassium include milk, bananas, raisins, green leafy vegetables and oranges, which all act as hydration supplements. By consuming a small snack consisting of foods from these two groups, you can easily replace your body’s electrolyte stores during or just after exercise, according to HuffPost. 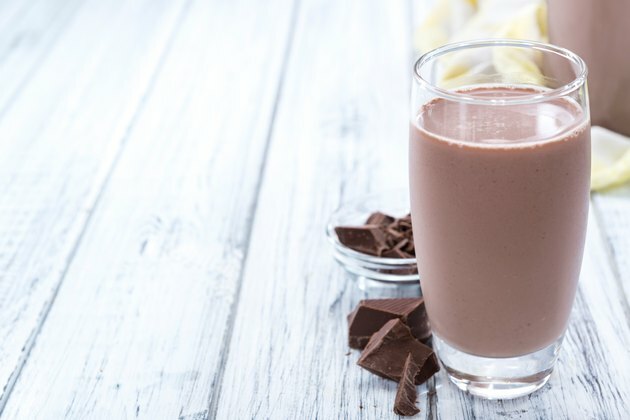 If you’re looking for a drink to replace electrolytes and aid recovery, low-fat chocolate milk may be the way to go, says UAMS. A study published by the University of Texas at Austin found that athletes who drank low-fat chocolate milk after exercise had more muscle and less fat than those who consumed carbohydrate-rich sports beverages. With its balance of electrolytes, protein, carbohydrates and fat, chocolate milk enhances the body’s ability to recover after physical activity. If you’re looking for a more natural alternative to Gatorade, one up-and-coming star is coconut water, with its notably high levels of potassium and is an electrolyte with out sugar added. Some coconut waters contain added sodium, so you can get both of the electrolytes you need. Although enhanced electrolyte waters may contain minerals, they are typically not in the quantity needed after strenuous exercise. The Food and Drug Administration regulates bottled water additives, requiring the nutrition facts label to reflect the contents. If you’re considering an enhanced drink with electrolytes, check the label to make sure it contains sodium and potassium at levels comparable to the leading sports drinks —roughly 160 milligrams of sodium and 45 milligrams of potassium per 12-ounce serving. One of the most vital times to ensure the body has adequate electrolytes is during illness. Illnesses that cause diarrhea can result in electrolyte loss, which can quickly reach dangerous levels. During this time, it is best to seek medical attention immediately. If medical attention is not immediately available, a pharmacist at the drug store may be able to provide advice about drinks with electrolytes or other products such as sports drinks. LiveWell recommends that adults and children should only consume sports drinks with electrolytes during or after extended and heavy exercise that lasts longer than an hour. Water is the better option for lighter workouts. However, after an intense and long workout, athletes would benefit more from eight to 16 ounces of a sports drink than from water. Researchers compared the effect of only water; water plus 8 oz of a sports drink; and half a banana, using 20 competitive cyclists on a 47-mile bike ride. The results, published in PlosOne in 2018, showed that drinking only water led to high levels of inflammation in the study group's blood. When the cyclists drank the sport's drink or consumed the banana, the levels of inflammation were much lower. University of Aranksas: Is Chocolate Milk a Good Post Workout Drink?